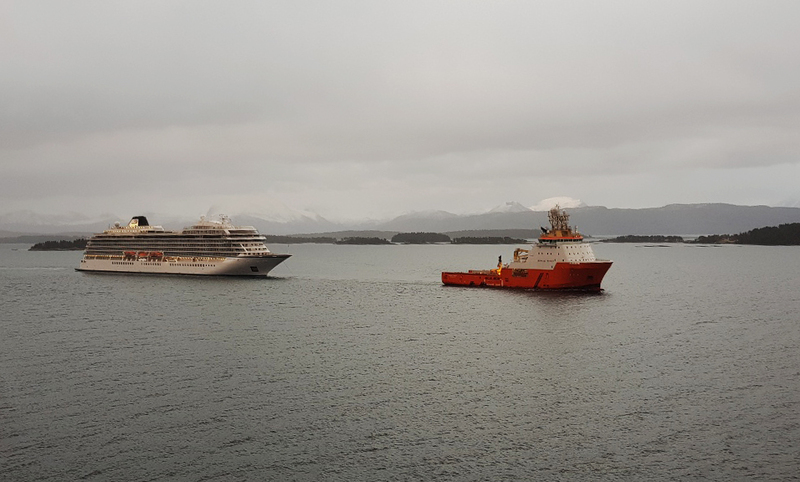 The Norwegian Maratime Authority (NWA) has issued their findings on why the 2-year old, 749-foot Viking Sky cruise ship lost all diesel engine power on Saturday, March 23, 2019. The engine oil pressure got too low due to up to 26-foot seas on the rocky southern Norway coast. Only anchors hastily deployed saved the 1,379 people onboard from abandoning a sinking ship hundreds of meters from the rocks. 479 people were airlifted off the boat. Throughout the night, the NMA has worked together with the ship’s classification society, Lloyd’s, and the company in order to identify the reason why the Viking Sky suffered power “blackout” at Hustadvika in challenging weather conditions on Saturday 23 March. For the present, our conclusion is that the engine failure was directly caused by low oil pressure. Last night, the Norwegian Maritime Authority (NMA) granted the company a permit to sail on a single voyage to Kristiansund to have necessary repairs made. Throughout the night, the NMA has worked together with the ship’s classification society, Lloyd’s, and the company in order to identify the reason why the Viking Sky suffered power “blackout” at Hustadvika in challenging weather conditions on Saturday 23 March. For the present, our conclusion is that the engine failure was directly caused by low oil pressure. The level of lubricating oil in the tanks was within set limits, however relatively low, when the vessel started to cross Hustadvika. The tanks were provided with level alarms, however these had not been triggered at this time. The heavy seas in Hustadvika probably caused movements in the tanks so large that the supply to the lubricating oil pumps stopped. This triggered an alarm indicating a low level of lubrication oil, which in turn shortly thereafter caused an automatic shutdown of the engines. The NMA has drawn up a general safety notice about ensuring a continuous supply of lubricating oil to engines and other critical systems in poor weather conditions. This should be done in cooperation with the engine supplier and, moreover, be included in the ship’s risk assessments in the safety management system. Norwegian Maritime Authority is in a continuous dialogue with the company and classification society, and this cooperation has been successful. We will follow up the ongoing work to rectify damages on vessels. Furthermore, we will continue the constructive dialogue with the classification society, company and the Accident Investigation Board Norway in order to reveal underlying causes and identify appropriate measures. The earlier press release on Monday, March 25, 2019, ruled out that the ship’s hull was damaged or the seawater cooling intakes were clogged. The NMA has had two inspectors from our survey office in Kristiansund, as well as a representative from our Section for Passenger Vessels in Haugesund, onboard the vessel. Our team will carry out further inspections/follow-up tomorrow, then in cooperation with the Police and the marine department at the Norwegian Accident Investigation Board (AIBN). The ship has also been examined by a diver, to verify whether or not there was any damage below the waterline. No damage to the hull of the ship was discovered. When the diver was down, the inlets for cooling water were also inspected, to make sure that they were not clogged. The inlets have been confirmed by the diver to be open and seemingly in order. The Accident Investigation Board Norway has initiated a safety investigation after the incident with the cruise ship Viking Sky’s engine failure at Hustadvika Saturday 23 March 2019. The United States and the United Kingdom consider they are substantially interested states and will participate in the investigation with their respective accident investigation branches. AIBN conducts its investigations for the sole purpose of improving transportation safety. The object of a safety investigation is to clarify the sequence of events and root cause factors, study matters of significance for the prevention of transportation accidents and improvement of transportation safety, and to publish a report with eventually safety recommendations. AIBN shall not apportion any blame or liability. Use of information from this investigation for any other purpose than for improvements of transportation safety shall be avoided.